During this Serbian Orthodox wedding in Milton, the Groom was full of emotion. 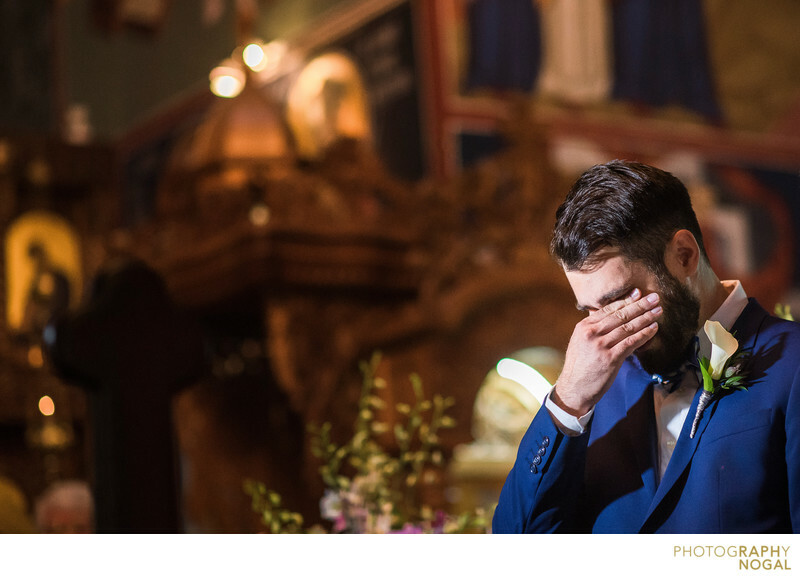 As he saw his Bride for the first time entering the church, he wiped away tears of happiness. When I photograph candid moments, I try to look not just through the viewfinder of my camera, but also be aware of other things happening around me. Seconds before this shot, I was photographing the Bride walking into the Church. Knowing that the Groom may react, I keep glancing back at him as the Bride was approaching. I could see his eyes getting teary and I knew a beautiful moment was about to unfold. Its all about being aware, planning and reacting that allows me to capture images such as this one. This image was lit with a video light as the church was extremely dark during the ceremony. Location: 7470 McNiven Rd, Milton, ON L0P 1B0.